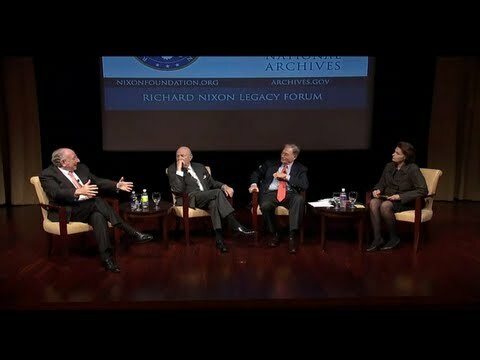 December 5, 2011: At the National Archives in Washington, D.C., former members of the Nixon administration gathered to discuss President Nixon’s approach to American labor issues and employment concerns. Moderated by Ann Korologos, Secretary of Labor under President Reagan, the panel consisted of William Kilberg, former Solicitor of Labor, Laurence Silberman, former Solicitor and Undersecretary of Labor, and Michael Moskow, former Undersecretary of Labor and President of the Federal Reserve Bank of Chicago. The panelists discussed such topics as the Nixon Administration’s relationship with organized labor and the measures taken to ensure a safe and equitable workplace for American laborers.